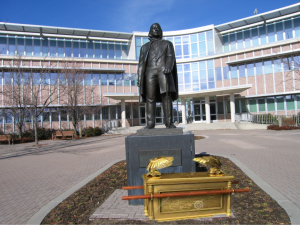 BYU faculty have been admonished again this week that BYU must be a great university but not after the manner of the worldly universities. This morning’s leaked video of BYU football players who have clearly had too much of their own entitlement to drink brings into sharp focus an area where there is room for immediate improvement. Clearly BYU’s fixation on winning and garnering lucrative ESPN contracts is not producing results that benefit the cause of moral superiority to which it so incongruously aspires. Perhaps BYU would be better off if it were to repent entirely—and in all meekness, thank you Elder Bednar—of its glory-seeking NCAA competition teams. The appeal that follows is undergirded by a simple but unproven (at least not by me) set of assumptions that flows from my experience at BYU(-Provo) and with numerous BYU faculty currently employed. As I said at the end of part 2: The vast majority of BYU faculty members want BYU to succeed as a uniquely LDS university. They care very much about its students and their success in negotiating a transition to adulthood as faithful Latter-day Saints. They have deep experience stemming from their own negotiation of this transition, and they want to help their students do the same, to give them a better launch maybe than the professors themselves received. They want to help students in their search for truth and their mastery of skills and to deal with their doubts and questions in constructive ways. My appeal is simple: Please, trust your faculty enough to invest power in them as a collective body, a power that they do not currently possess. It will make BYU a stronger, better institution, better able to deal with the rapidly changing landscape. It will allow for the rehabilitation of areas of inquiry vital to the mission of the University and Church that have atrophied because they have been denied the oxygen of accountability and appeal. It will create an ability to identify and rectify abuses of power among administration as well as faculty and create a stronger sense of commitment to the University and not just to the Church. It will look better to accreditation boards. And it will help avoid some of the scandals that have plagued the faculty (especially Religious Education) recently (see part 2). 1. Increase the clarity of the vetting criteria. Departments and candidates need to know what will get them rejected before the departments even see their names. It is against the order of the Church and of God to hide the standards by which we are judged. It is wrong not to tell deans, departments, and candidates where the apparently bright lines lie and to assert, as did the AVP to at least one administrator, that he is not going to tell [departments] the line so that they don’t even come close to it. It flies in the face of D&C 121, not to mention just about everything we say about commandments, judgment, and self-improvement. 2. Allow the departments to choose their own candidates to interview. There are ample opportunities for serious conversations to be had about any problems that surface in the vetting process. Candidates interview with multiple department members, the department chair, the dean, the associate AVP, and a General Authority before they take up a position. And then once they receive a job offer, they are continuously monitored through ecclesiastical endorsements, annual reviews, third-year review, CFS review, and can be terminated or disciplined even after CFS. Under the current office of Academic Vice President, departments see a list of applicants only after it has been vetted by this single office. The best candidates, which departments themselves often have recruited and urged to apply, are often not even given a chance to interview. Neither the department nor the candidate knows (in theory) that nor why they have been rejected from the list of potential interviewees. Neither party knows whether there may have been a mistake, an overweening bishop, a misunderstanding of the candidate’s portfolio, or something else that they may have done, said, or published that had them rejected. We know by happenstance that one criterion for rejection the AVP decided on—without informing any departments or candidates beforehand, and certainly not declaring it publicly—was whether the candidate had published in the journal Dialogue, regardless of the content of the article. 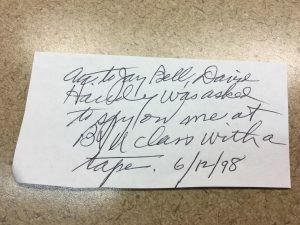 This practice of course results in embarrassment to the department, confusion for the candidate, and ultimately damage to BYU’s reputation and strength. 3. If a candidate is rejected by the AVP, let the rejection letter come from the AVP office, and do not make departments send rejections to candidates they have not even evaluated. Candidates deserve to know at what level they have been rejected, if not the reasons for such. 4. Implement annual or semi-annual evaluations of the administration. Professors are evaluated at least every year from the “bottom-up” in student evaluations and from the “top-down” in their departments and colleges. The benefits of bottom-up evaluation are constantly cited in the use of student evaluations in the advancement process. These benefits would also make the administration stronger and more responsive, alert superiors to consistent problems as well as successes, and give faculty a voice. There is no reason not to allow faculty to evaluate their administrators. 5. Most important, invest real power in a Faculty Senate. The Faculty Advisory Council currently has, as its name suggests, only power to act in a weakly advisory capacity. Its recommendations are routinely and summarily dismissed by administrators, creating a vacuum of accountability. If you trust that the majority of your faculty will choose what is in the best interest of the University and its sponsors, a Faculty Senate would only increase the health of the institution by allowing egregious abuses of power to be identified and corrected. As it stands, the maintenance of an anemic FAC is a constant signal of mistrust between administration and faculty, and it hamstrings the ability of the faculty to act in ways that improve the institution because of their concern that they have no recourse if they run afoul of an administrator or colleague. It decreases the faculty’s ability to pursue truth and to strengthen the institution, to serve the students and the Church. If the faculty as a whole cannot be trusted with some amount of shared governance, one wonders what good can ultimately come from maintaining institutions of higher education in the Church. That much good does come from BYU suggests that the faculty can indeed be entrusted with more power. It would also increase the investment made by faculty in the university, a greater sense of a shared endeavor. A healthy institution is better for the entire church, not to mention for the students and faculty who pursue the noble objectives of Brigham Young University. These relatively minor changes would go a long way toward improving the institutional health of BYU.